Many community members may be wondering where they can find opportunities to volunteer and give back to the community. There are several options available for those who wish to get involved. PruittHealth in LaFayette: PruittHealth is always taking volunteers to come visit, chat, and read to the residents. For more information call them at 706-638-4662. Rosewood Assisted Living: Rosewood (Fort Oglethorpe) is taking volunteers of a large variety. They will take anyone from long-term volunteers all the way to onetime volunteers. The opportunities range from setting up events, hanging out with residents and reading to them, or even just setting up goodie bags. For more information contact Sharon Shedrick (Life Enrichment Director) at 706-866-4443, ext. 133. To help with the Dementia Care Department, contact Karen Ottaway (life enrichment coordinator) at 706-866-4443, ext. 130. The Haven in LaFayette: The Haven is a church and ministry that reaches out to the homeless and those in need. Contact them 706-638-6418 and ask for Tanya. Care Mission: The Care Mission in LaFayette is a food pantry and ministry. They are always taking volunteers. To complete an application, visit them in person at 105 N. Chattanooga St. in LaFayette. Me and my Girls Thrift Store: Located behind the Family Dollar in LaFayette, this store is taking volunteers to work in the store. Check in person for volunteer opportunities. Most of these opportunities are ongoing, and more are opening up every day. If you enjoy working and being with children, check with your local school and day care to see what their current needs and opportunities may be. Keep up with us to hear more about local opportunities for volunteer work. Honorees hold their award plagues as their supervisors stand with them. Honorees are (from left holding plagues) Deputy Eric Head, Walker County; Dacia Doyle, accepting for her late husband, Commander Patrick Doyle, Drug Task Force; Major Tommy Bradford, Dade County; Cpl. Aaron Campbell, Catoosa County; and TFC Jason Ballard, Georgia State Patrol. "It is important to recognize heroic accomplishment." 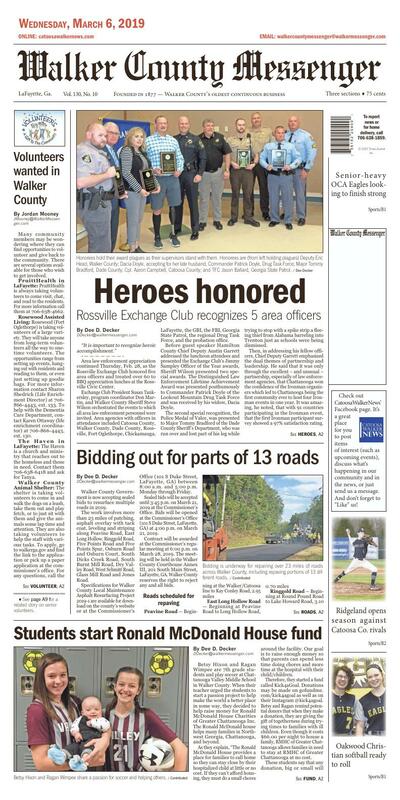 Area law enforcement appreciation continued Thursday, Feb. 28, as the Rossville Exchange Club honored five area officers and treated over 60 to BBQ appreciation lunches at the Rossville Civic Center. Exchange Club President Susan Tankersley, program coordinator Don Martin, and Walker County Sheriff Steve Wilson orchestrated the events to which all area law enforcement personnel were invited. Area agencies with officers in attendance included Catoosa County, Walker County, Dade County, Rossville, Fort Oglethorpe, Chickamauga, LaFayette, the GBI, the FBI, Georgia State Patrol, the regional Drug Task Force, and the probation office. Before guest speaker Hamilton County Chief Deputy Austin Garrett addressed the luncheon attendees and presented the Exchange Club's Jimmy Sampley Officer of the Year awards, Sheriff Wilson presented two special awards. The Distinguished Law Enforcement Lifetime Achievement Award was presented posthumously to Commander Patrick Doyle of the Lookout Mountain Drug Task Force and was received by his widow, Dacia Doyle. The second special recognition, the Police Medal of Valor, was presented to Major Tommy Bradford of the Dade County Sheriff's Department, who was run over and lost part of his leg while trying to stop with a spike strip a fleeing thief from Alabama barreling into Trenton just as schools were being dismissed. Then, in addressing his fellow officers, Chief Deputy Garrett emphasized the dual themes of partnership and leadership. He said that it was only through the excellent – and unusual – partnership, especially of law enforcement agencies, that Chattanooga won the confidence of the Ironman organizers which led to Chattanooga being the first community ever to host four Ironman events in one year. It was amazing, he noted, that with 91 countries participating in the Ironman event, that the first Ironman participant survey showed a 97% satisfaction rating. Garrett attributed this phenomenal rating to the tremendous partnership and teamwork of everyone involved in the event. Garrett then shared that to him leadership meant a conscious giving of self and "adding value" to one's organization, to one's coworkers and peers, and to one's community. Constantly giving, investing in and continually building up everyone around you is the true role and philosophy of a leader, he said. He then turned his attention to the three leaders and recipients of the 2019 Officer of the Year awards, reading the letters of nomination for each, describing their service or heroic actions for which they were nominated, and then presenting each officer with his award. "On October 23, 2018, Cpl. Cantrell was dispatched to a motor vehicle accident with entrapment. The passenger of the vehicle was partially entrapped in the vehicle, and the vehicle was on fire. As Cpl. Cantrell pulled up, EMS was on the scene but had not yet acted. Cpl. Cantrell selflessly approached the vehicle, with flames inside the passenger compartment, and pulled the passenger to safety. Had Cpl. Cantrell failed to act, this passenger would have been burnt worse and even possibly died. Cpl. Cantrell's act was selfless and heroic." "On July 18, 2018, Deputy Head was dispatched to Fox Mit Lane. The caller advised the 911 dispatcher that a 14-year-old boy had wrecked a dirt bike and was reported to have a severe laceration to the chest. The caller further stated that the boy was having difficulty breathing due to being impaled by the dirt bike handlebars. Upon arrival, Deputy Head found the boy to have labored breathing, with a large three to four inch circular open chest wound. Deputy Head immediately recognized that the boy had a traumatic pneumothorax injury which allowed air to enter the chest cavity causing the lung to collapse. Based on his training, Deputy Head knew that without quick treatment, the wound could prove fatal. Deputy Head immediately went to work and improvised a chest seal by using a plastic evidence bag secured with tape to seal off the wound. This action prevented air from entering the chest cavity and causing the lung to collapse, but at the same time allowing excess to vent to allow for more normal breathing. While awaiting the EMS, Deputy Head stayed by the boy's side reassuring him and talking with him. When EMS arrived, the boy was stabilized and transported to the hospital. The following day, I received a telephone call from the treating physician. The doctor told me that the EMTs had told him about Deputy Head's quick action to save the boy's life. The doctor told me that if Deputy Head had not initiated live saving measures on the scene as quickly as he did, the boy most likely would not have survived the accident." In October 2018, TFC Ballard was the only Post 41 Trooper called upon to assist with the recovery effort from Hurricane Michael. ... TFC Ballard spent two weeks in southwest Georgia, providing aid and comfort to residents of the affected area. TFC Ballard worked mostly 16-hour days for both weeks insuring that needed supplies were delivered, performing traffic control operations, and serving as law enforcement for areas where services were either stretched very thin or were non-existent. Despite knowing the long hours and less than desirable accommodations of such an assignment, he displayed his typical selfless attitude, and he completed his duties without complaint. This Trooper's performance clearly demonstrates that he cares for not only the community he serves, but for citizens throughout the state of Georgia." As someone was overhead to comment following the awards as officers were congratulating their colleagues and chatting among themselves, "it is important to recognize heroic accomplishments." Such leadership by example indeed sets the standard and motivates and inspires everyone for the coming year. Bidding is underway for repairing over 23 miles of roads across Walker County, including repaving portions of 13 different roads. Commissioner Whitfield has repeatedly said that S Dicks Creek Road off Hwy 136 in the Armurchee Valley is one of the worst in the county. Over the years continued freezing and thawing and intense heavy truck traffic, especially logging trucks, have caused sections of the road to nearly disintegrate. Walker County Government is now accepting sealed bids to resurface multiple roads in 2019. The work involves more than 23 miles of patching, asphalt overlay with tack coat, leveling and striping along Peavine Road, East Long Hollow, Ringgold Road, Five Points Road and Five Points Spur, Osburn Road and Osburn Court, South Dicks Creek Road, South Burnt Mill Road, Dry Valley Road, West Schmitt Road, Glass Mill Road and Jones Road. Specifications for Walker County Local Maintenance Asphalt Resurfacing Project 2019-1 are available for download on the county's website or at the Commissioner's Office (101 S Duke Street, LaFayette, GA) between 8:00 a.m. and 5:00 p.m. Monday through Friday. Sealed bids will be accepted until 3:45 p.m. on March 21, 2019 at the Commissioner's Office. Bids will be opened at the Commissioner's Office (101 S Duke Street, LaFayette, GA) at 4:00 p.m. on March 21, 2019. Contract will be awarded at the Commissioner's regular meeting at 6:00 p.m. on March 28, 2019. The meeting will be held in the Walker County Courthouse Annex III, 201 South Main Street, LaFayette, GA. Walker County reserves the right to reject any and all bids. miles AND from Veeler Road to state route 95. Betsy Hixon and Ragan Wimpee share a passion for soccer and helping others. Betsy Hixon and Ragan Wimpee are 7th grade students and play soccer at Chattanooga Valley Middle School in Walker County. When their teacher urged the students to start a passion project to help make the world a better place in some way, they decided to help raise money for Ronald McDonald House Charities of Greater Chattanooga Inc. The Ronald McDonald house helps many families in Northwest Georgia, Chattanooga, and beyond. As they explain, "The Ronald McDonald House provides a place for families to call home so they can stay close by their hospitalized child at little or no cost. If they can't afford housing, they must do a small chores around the facility. Our goal is to raise enough money so that parents can spend less time doing chores and more time at the hospital with their child/children. Therefore, they started a fund called Kick4aGoal. Donations may be made on gofundme.com/kick4agoal as well as on their Instagram @kick4agoal. Betsy and Ragan remind potential donors that when they make a donation, they are giving the gift of togetherness during trying times to families with ill children. Even though it costs $66.00 per night to house a family, RMHC of Greater Chattanooga allows families in need to stay at RMHC of Greater Chattanooga at no cost. help make an impact. 100% (excluding the Go Fund Me transaction fees) of donations will go toward helping RMHC of Greater Chattanooga. Interested parties are also asked to please consider sharing their page on social media (https://www.gofundme.com/kick4agoal) to help spread awareness and show support in reaching their goal. In conclusion, Betsy and Ragan say, "Thank you for all the support and help with our Kick4aGoal passion project. We hope that this will lead the way for many other students our age to give to a cause that they believe is just as important as the Ronald McDonald House."